The Factory. Kila Kokonut Krew. Q Theatre. 6th – 24th March. On christmas morning I open this envelope. Everyones watching so I have to give an exaggerated smile before I even realize what it is. First thing I notice is that it’s a single ticket, great. Then I see my sister has one too. We have no idea what it is, just that we’re going to Q Theatre to watch to token Pacific play of the Auckland Arts Festival. We just finished round the bays so we’re exhausted, my biggest anxiety; to not fall asleep. My biggest excitement; to see my friend who works at Q. But Twitter told me it was going to be good. And then they sang. The haunting vocals filled the theatre and chilled my body. I knew it was going to be good. Pacific New Zealand History is an obsession. When the Kila Kokonut Krew comes out on the dark days for the Pacific diaspora you can’t help but assume it will be an inappropriately humorous take on someones journey to the land of milk and honey. Something to capture the ignorant audiences laughs without disclosing the full impact of the sociopolitical history on todays situation, without connecting it to the marginalistation of our people. However, in reality there was no doubt about a good amount of humor, no doubt there were inappropriate caucasian laughs, but the narrative, mean. One of the most inspired historical reincarnations. All your favorites were there. You had Mose your young panther revolutionary that stirred the pot slightly too much for the contentment of the general passive Poly population. You had your racist bourgeois factory owner only interested in the economic gains of the Pacific labour force. Your struggling Pacific father, who quietly exemplifies the model employee trying to provide for his family back in Samoa. Your loud, proud and beautiful Fa’afafine uncle/aunty. And of corse your white Robin Hood who falls in love with the smart dusky maiden. While it may seem as though they just covered all the stereotypes in fact it was a sophisticated cover of every Pacific struggle. Everyone knows that dad and if not the daughter, yet it was so specific and personal that you were pulled into an intimate story of young love. The mirroring of an entire generation in an hour long play takes skill, creativity and intimidating brain power many wish was attainable. Most admirable is that nothing was sacrificed for artistic decisions, but in fact all artistic decisions enhanced the narrative. If the first Pacific musical is at a standard this high, then one can only imagine what is subsequent. So on point. 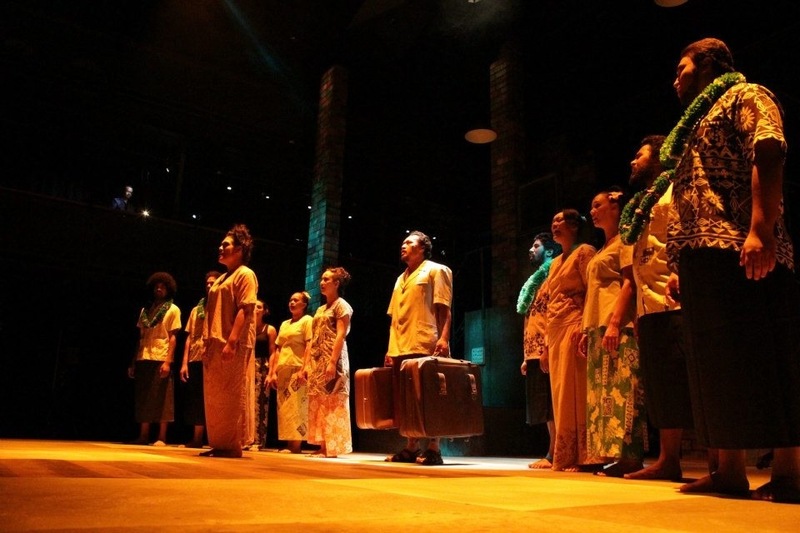 ‘The Factory’ is the product of Kila Kokonut krew’s Anapela Polaitavoa (writer/director) and Vela Manusaute (producer/writer/director) and is New Zealand’s first Pacific musical. It is set in 1970’s and tells the story of a young Samoan women who with her father arrives in Auckland to start working at the factory to help support her family back home in the Islands. Essentially it’s a classic love story between a young man and the young Samoan women whose future together is uncertain due to the prejudice. What sets the ‘The Factory’ apart from other love stories is the subtle yet clear socio, political and economic context of the Pacific peoples migration to New Zealand. This representation of migration through a musical is extremely rare and refreshing. Tens of thousands of Islanders migrated to New Zealand in search of the milk and honey dream. In reality what many received were poor housing conditions, poor working conditions, discrimination (including misrepresentation in the media) and the introduction of dawn raids on suspected illegal immigrants aka overstayers. This New Zealand history is shameful and can be easily swept under the carpet and forgotten if not for productions like ‘The Factory’ to sustain important historical dialogue (because let’s face it they’re not going to teach this history in schools). It’s extremely hard to find any faults with ‘The Factory’, it was hilarious, it was sad, it was romantic- in short it was everything you want in a narrative supported by solid performances from actors. The strong vocal performances from the cast combined with the band’s ancestral rhythmic drum beats left you in complete awe. I also felt the use of Samoan dialogue in the musical was really successful. It made ownership of the musical very clear without excluding those who didn’t understand (including myself) and added a certain vibrancy and animation through body language. Next PostBattle of the Bastards at Basement Theatre.